Leicester need three points from their remaining three games, at most, to be crowned Premier League champions. That is astonishing enough given they were 5,000-1 outsiders last August. But the manner in which they have put themselves in this position is also jaw-dropping. Even with three games to play they have utterly obliterated their previous record points total for a Premier League season. That was 55 points in 1999-2000 when they finished eighth. They already have 76 this season, beating their previous best by 21. And counting. They are one of two clubs in the current PL who are guaranteed their best PL season, with Watford the other. Watford’s best ever season before garnered them 28 points and they have already got 41. Our first graphic depicts the ‘best of seasons, the worst of seasons’ for the clubs. Five clubs could yet have their best PL seasons: West Ham need two points from four games to achieve that, Tottenham need four from three, Southampton seven from three, Stoke eight from three and West Brom nine from three. It’s not going to happen for all of them but perhaps some. The next category is our ‘meh’ teams who cannot have their best PL season whatever happens and who have dodged their worst. The stats below speak for themselves. 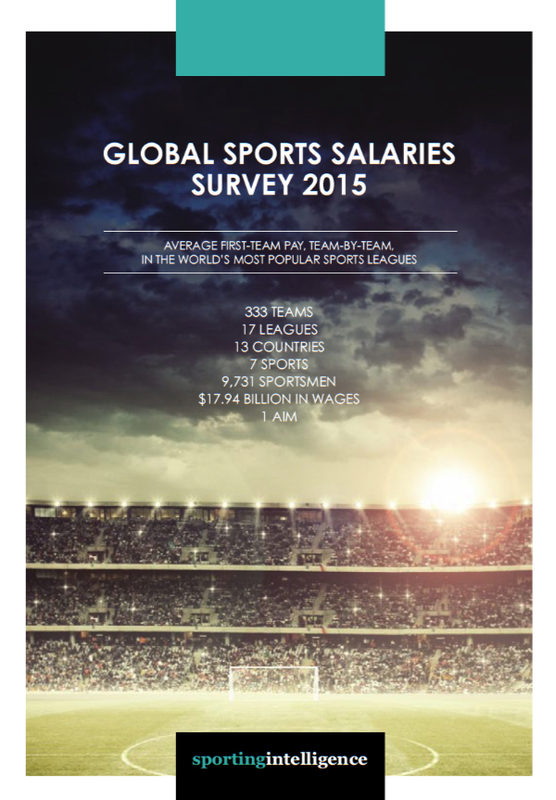 It’s notable that ‘big’ clubs Arenal, Liverpool and Manchester City are all in this group. By their own high standards all of them would want to be doing better. 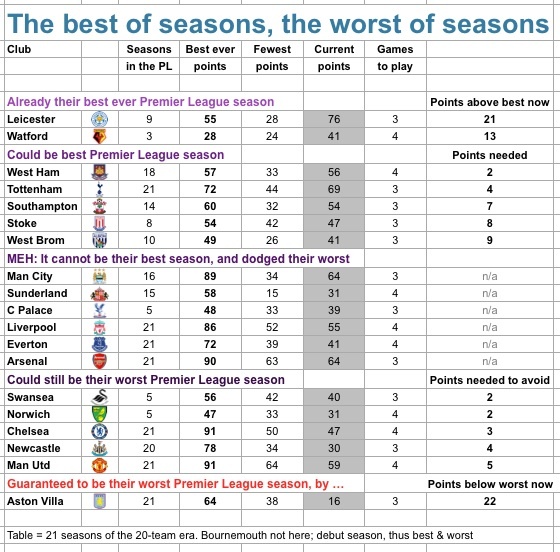 Five clubs could yet have their worst PL seasons, Chelsea included, and Manchester United. The presence of that pair in this category and the other ‘big’ clubs in the ‘meh’ bracket helps to explain how Leicester have been left relatively unhindered by serious challenges from the ‘top’ clubs. Aston Villa are already guaranteed their worst ever season but we’ve already covered their decline recently, here and here, and to dwell on it further would be to intrude on private grief. With Leicester seven points clear of their only remaining title challengers Tottenham, Spurs will need an absolute minimum of seven points from their three remaining games (while Leicester lose all their three) to have any chance of remarkable last-gasp glory. And given their record against their next opponents Chelsea, it would be remarkable indeed. Famously it was 10 February 1990 that Tottenham Hotspur last won a league game at Stamford Bridge, venue for their next match, on Monday. They did it by two goals to one with Howells and Lineker finding the net for Spurs and Bumstead replying for Chelsea. Since then Tottenham have played 25 league games at Stamford Bridge, losing 17 and drawing eight. A total of 51 Chelsea goals in those game have been answered by only 16 from Spurs. Tottenham have visited 46 clubs in the Premier League era in league action and have had at least one win at all of them but seven. Here’s the list and the number of visits they’ve had in search of that first Premier League win against those opponents: Barnsley (zero PL wins in one visit); Blackpool (zero in one visit); Swindon (zero in one visit); Bradford (zero in two visits); Burnley (zero in two visits); Sheff Utd (zero in three visits); Chelsea (zero in 23 visits, ouch). The Chelsea versus Tottenham game will complete the London derby fixtures for this season. For so long Arsenal and Chelsea have dominated the outcome of the inter-capital games but not this season. Currently West Ham head the table but a Tottenham win on Monday would edge them ahead on goal difference. Arsenal have just the one London victory all season, 2-1 at Palace back in August. Palace have lost all four home London games but had a memorable 2-1 win at Stamford Bridge in August. Tottenham and West Ham have only the one London defeat each, when they were playing each other away from home.